The Mahabharata tells us the stroy of Shalya, whose sister, Madri, was the second wife of Pandu. Her twin sons, Nakula and Sahadeva, were the youngest Pandavas. When war was declared between the Pandavas and the Kauravas, Shalya naturally planned to support his nephews against their cousins. But on the way to the battlefield, he was tricked into supporting the other side. As Shalya’s army moved south from Madra towards Kurukshetra, Shalya found refreshments being arranged for his army along the high road. Much pleased, he declared unwavering support for the provider of these refreshments, assuming this was the work of the Pandavas. To his surprise, the organiser of these refreshments was Duryodhana, the leader of the Kauravas. Shalya had no choice but to uphold his words and fight against his own nephews. Though king, Shalya was asked to serve as charioteer to Karna, the charioteer’s son. Karna liked this until, much to his irritation, Shalya kept praising the archery skills of Arjuna, Karna’s arch rival. This constant praising and comparison demoralised Karna. Later, when the wheel of Karna’s chariot got stuck in the ground, and Karna asked Shalya to pull it out as it was the job of charioteers, Shalya said, “But I am a king. I don’t know how to pull out wheels of the chariot. That is what charioteers like your father do.” Shalya thus turned out to be a liability for Karna. 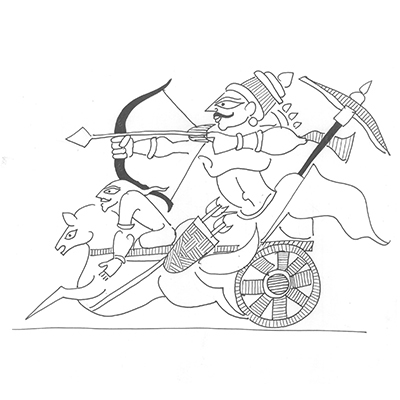 Karna was forced to get down and pull out the chariot wheel, and while he was busy thus, he was killed by Arjuna. While Duryodhana had forced Shalya to fight on his side, he had failed to win Shalya’s loyalty. Shalya was bound only by his word, not by his heart. And this worked against the Kauravas. This is what happens when people are forced into contracts. One ends up with reluctant partners in business. And a partner whose heart is not in the right place is an enemy from within. Sankalp was setting up a chain of canteens in an industrial belt. His costs were too good to be true and so he got contracts from almost all the companies in the area. He then negotiated hard with his vendors. He spoke sweetly with them and got them to sign the deal. His strategy was to work very fast, so fast that the vendors would be under too much pressure to read the fine print before signing. In the fine print were terms that Sankalp would take advantage of later to get the best rates. These were best rates for him, but worst rates for the vendors. They would end up with really thin margins. Sankalp felt powerful that he had bargained ruthlessly. But his vendors resented him. They felt they had been cheated. They became angry and bitter. Desperate to increase their margin, they started compromising on the quality of goods supplied. The vegetables were not as fresh as they used to be. The cold chain used was of poor quality. The workers who handled the supply were not well trained. This resulted in delays, mismanagement, stress, chaos. The food of the canteen was no longer as tasty as it was. The customers complained. Sankalp picked up the phone and yelled at his vendors. He demanded they keep their end of the bargain. They yelled back that they had stuck to the letter of the contract, just as he did. What was left unsaid was that vendors resented being abused so. They were angry at being arm-twisted and had found subtle ways of expressing their rage. What Sankalp had done to keep the contract away from competition now worked against him. The vendors who had signed up ended up, inadvertently, creating a situation that favoured the competition, They became Shalyas who worked against the Kauravas for the Pandavas from within. Leaders often forget that getting the deal is not the same as winning the hearts. We end up with enemies within.